At the TechCrunch Disrupt conference held in San Francisco, Google Marissa Mayer came to the stage and talked about Michael Arrington and after revealing the couple new Google's Instant features she went ahead to talk about the status quo of the present social media profile. Google was asked about their plans for their upcoming social strategy, and it was soon turned to the failed product: Orkut. Mayer accredited the failure due to its too slow approach in the US making it absolutely dissolute after its initial launch in the social media world. The platform came into being in January 2004 and as Mayer continues, it soon attracted thousands of users in a few days. This resulted an overwhelming response and soon enough, the network slowed down to a crawl which led to users actually abandoning the platform, as in the US it has and always been about speed. Google did take a bit of time, and eventually it was able to scale Orkut for the traffic surge, despite all the efforts, the platform was too late to overcome its failure in USA. Mayer indicated this as the most probable reason. While Mayer about Google'e effort to play catch up in the Facebook or Twitter, she gushed, she affirmed that Google's approach is completely different from mentality of Facebook and therefore, we can expect Google doing something great with the social platforms. Google will continue with its loyalty towards Orkut at least in places where it is popular still like in Brazil and India, and she claims that Google is always pleased with the present status. People are still migrating to more popular platforms like Facebook, even if Orkut redesigning its interface and adding more popular features similar to the Facebook. Firstly, the platform had an interface with pink color that is not acceptable by the male community. The spread immediately was stagnated as it became something associated with the more "feminine" users and not with the "masochist" male. 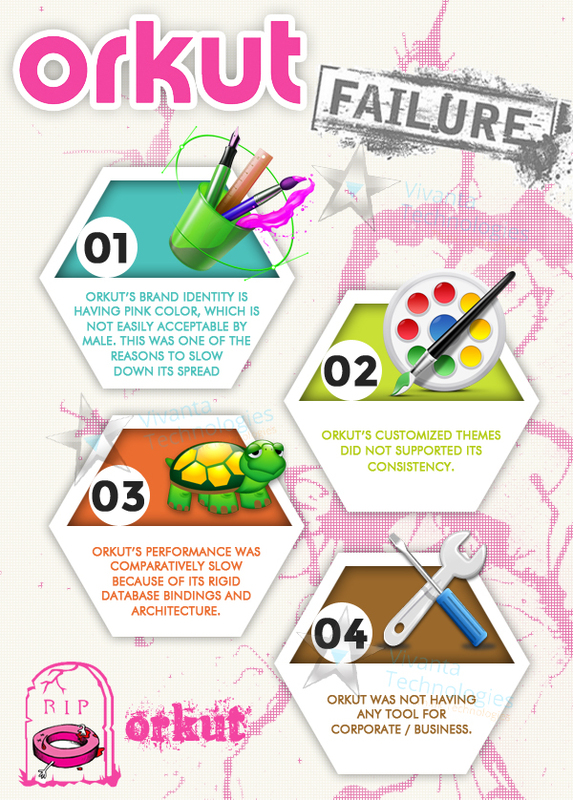 Secondly, the customized themes in Orkut did not support the consistent flavor of the platform and lastly, the platform did not contain business tools like Facebook integrated very soon within its launch. All these small features led to the failure of the entire platform because Facebook ensured to keep changing its interface along with the trends that were doing rounds. Google Plus has integrated various features to ensure the interest of the users. Only time will tell whether the platform cease its existence completely, or whether we will see its revival in the near future.